Moms, no doubt your kids like mine use apps on their ipads and devices to play games and learn! There are some amazing apps out there that have taught our kids so much…we just have to be vigilant in limiting the amount of time spent on technology and get our kids to GO OUTSIDE AND PLAY!! Balance and monitoring the sites/apps (see this article) is they key, I think! 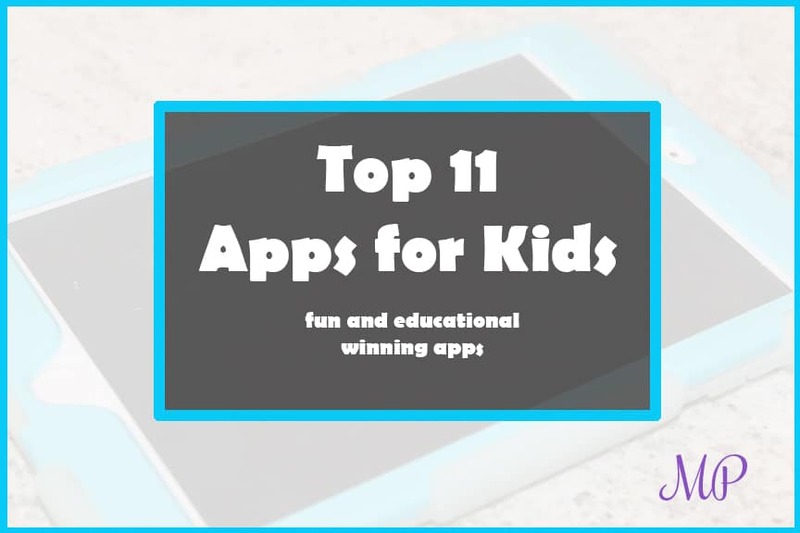 The apps below are chosen because they are our kids’ favorites! They are usually free or very inexpensive, and honestly, very valuable to our kids’ learning and development. 11. Starfall – This app is great for preschoolers and kindergartners, helping them learn ABCs, including beginning reading and math in a fun format with games and graphics. 10. Teach Me– Another great app, this app features customized learning by saving kids’ progress. 9. A Kid Like Me– This app is great because it teaches children about kids around the world through videos and games, opening their eyes (in a good way) to different cultures around the world. 8. The Bible App for Kids– Animated short videos of Bible stories help our kids visualize the great stories from the Bible. 7. ABCYa – This app includes many games for kids from Kindergarten up to 5th Grade that make learning concepts in math and reading fun. 6. Epic – We love this app because you have a whole library of books at your fingertips! Over 10,000 books available with unlimited access for kids age 12 and under. This app costs $4.99 per month, but our kids love to read so it is worth it! 5. ABC Mouse – For little ones, this is a popular app for teaching letter sounds, colors, numbers, and beginning reading through games, books, puzzles, and more. Check the app for pricing. 4. Minecraft – Not to be left out, this app is so popular with kids and the learning aspect is phenomenal. Building constructions out of textured cubes to create worlds, using their creativity and resourcefulness to survive in that 3D environment. 3. Brain POP and Brain POP Jr – Educationally aligned around curriculum standards, these apps include a variety of subjects to help kids learn and master educational requirements for school in a fun way! 2. LEGO Jr – Kids can use their imaginations to create LEGO vehicles and figurines to help them navigate through the scenarios in the apps. 1. Stack the States and Stack the Countries – Tied for Number 1…Our kids LOVE these apps!! Very inexpensive for the paid version, but sooo worth the cost! Our kids have learned state and country capitols, their locations on the map, and facts about these places. WARNING: This app is addicting- your kid might not be able to put it down and may learn more than you know about geography in the process! The technology out there for the next group of kids growing up is amazing! These are just a few of the apps for kids available. Check out iTunes for these and many more! What are your favorites?